Home » Foreign Direct Investments and International Tribunals: Why the connection is important? Foreign Direct Investments and International Tribunals: Why the connection is important? Foreign Direct Investments (FDIs) have been the main engine in the economic growth of countries with developing economies. Nowadays, institutions of international business law are facing certain challenges in the area of foreign investment. These challenges mostly rise up from the nature of legal system in recipient countries. Because of their specific nature such as favorable atmosphere for foreign investors, international tribunals also have different approaches regarding these cases. This paper will focus on these factors of foreign investment to understand its nature, specifically in the Asian countries, including Mongolia. One of the purposes of the underlying research is to provide a new understanding of foreign investment based on the factors such as diverse legal systems and arguments of international tribunals to these countries. Under the favorable atmosphere for the foreign investors we can include a few positive steps toward stable investment, such as new legislation in the scope of international investment. Usually host states adopt new laws which give foreign investors the same rights as domestic investors, and provide them with a legal framework to protect their investment. For example, Mongolia passed a new Investment Law of Mongolia in October 2013, which replaced the Foreign Investment Law of 1993. The above law encourages foreign investment by setting out tax stabilization incentives and other non-tax incentives. It also simplifies the registration process for setting up a business which only requires to be registered in the Intellectual Property and State Registration Office (IPSRO). Such a clarified procedure shortens the duration of opening a business operation making it 30 days in total. The Investment Law of Mongolia also includes a provision for an ‘Invest Mongolia Agency’, which will focus on promoting, supporting, and regulating investment activities and is in charge of issuing stabilization certificates to the investors and monitoring whether such certificate holders are operating in compliance with Mongolian laws and regulations. The applicable rates of the following taxes, fees and duties can be stabilized under stabilization certificates for a period up to 18 years, and may be extended to 27 years for qualifying projects such as corporate income tax or customs duty. Such behavior from a host state is a usual activity in the international investment area. As we can see, all these legislations aim to make a better environment for foreign investors, so investors can consider host countries potentials. Another important point of international investment law was developed through dispute settlement procedures of arbitral tribunals which hear claims between foreign investors and host states brought under international investment treaties. Oddly enough that these cases were not brought by diplomatic channels, intergovernmental negotiations. This explains that international investment law develops more in view of arbitral precedent and case law than on the basis of traditional textual approaches to treaty interpretation. Nevertheless, applying investment treaties in practice as well as studying and understanding the field not only requires knowledge about the jurisprudential developments but also demands awareness of the historic, economic, and customary international law context of foreign investment activities. The most used dispute settlement system is Investor-State Dispute Settlement or shortly ISDS. It is a system through which investors can sue countries for alleged discriminatory practices. Provisions on ISDS can be a part of a bilateral agreement (between the home state and the host state) or be a part of international (multilateral) investment agreement. If an investor from one country (home state) invests in another country (host state), both of which have agreed to ISDS, and the host state violates the rights granted to the investor under the treaty (i.e. thebilateral or the multilateral agreement), then that investor may bring the matter before an arbitral tribunal. Talking about arbitral tribunals we should mention the International Centre for Settlement of Investment Disputes, which takes place under the auspices of international arbitral tribunals governed by different rules or institutions. For example, the London Court of International Arbitration, the International Chamber of Commerce or the UNCITRAL Arbitration Rules. There are certain challenges in international arbitral tribunals regarding international investment cases. First of all, while the current ISDS mechanism may work well from the perspective of international investors, it entails considerable risks for host country governments. Under these risks fall the fact that aggrieved investors have a choice between seeking remedy either under the domestic law of a host country or the applicable international treaty (or both), while host countries do not have that choice, as only investors can initiate the ISDS mechanism when disputes between investors and host countries arise. Second of all, it is also questionable that only big investors have access to the dispute settlement mechanism, while small and medium-size enterprises cannot initiate the ISDS process. In addition to all of that, there are other problems such as private arbitral panels adjudicate over public policies; conflicts of interests exist for arbitrators, including conflicts of interests that may compromise their independence; that there is no real possibility for the review of arbitral decisions taken; that poor countries are not in a position to defend themselves as respondents; investors engage in abusive treaty shopping to benefit from ISDS; and the costs of the rising number of claims are high, both in terms of the costs of the arbitration process and the potential awards involved. With all these difficulties there arise questions regarding the prevention of international investment disputes going to arbitral tribunals. At the national level, the prevention, management, and resolution of disputes between foreign investors and host countries are imperative. In particular, it is imperative for countries to avoid such disputes reaching the international (arbitration) level. This means that, other alternative dispute resolution approaches such as mediation should be effective. As to international dispute settlement, a number of options should be considered to improve the ISDS mechanism. Some of these should be relatively straightforward. For instance, abusive treaty shopping to obtain the protection of an International Investment Agreement and its ISDS mechanism could be limited sharply by requiring that a substantial presence test be met. For the further understanding of influence of international arbitral tribunals in investment disputes, examining the case law would be a better approach. The arbitration was brought by three claimants for their investment in a uranium exploration and extraction project in the Mongolian province of Dornod (the Dornod Project). 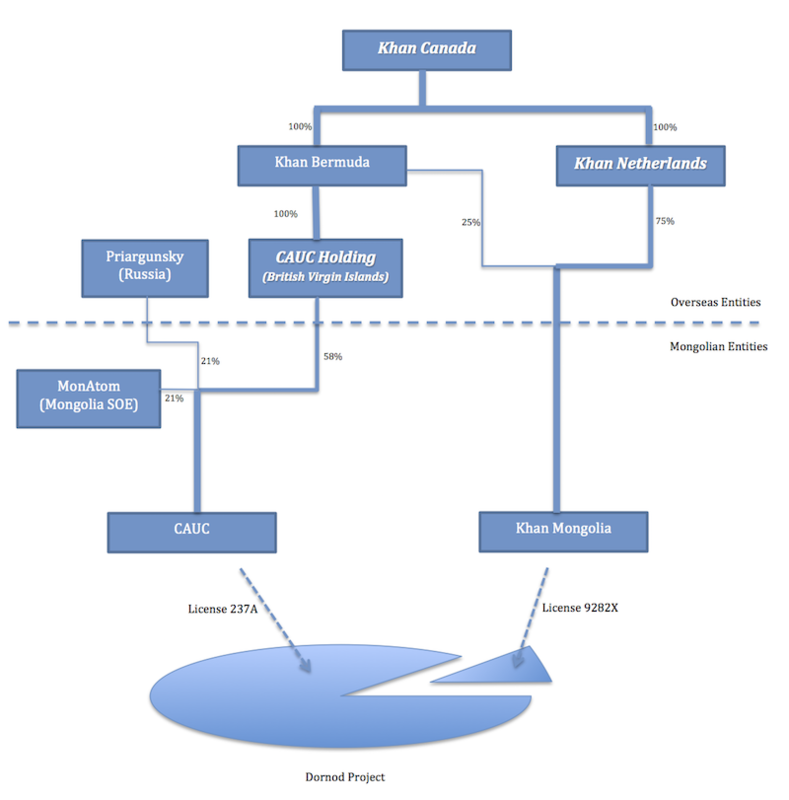 The claimants were (1) CAUC Holding Company Ltd (CAUC Holding), a British Virgin Islands (BVI) company investing in the Dornod Project through its majority-owned Mongolian subsidiary Central Asian Uranium Company (CAUC); (2) Kahn Resources B.V. (Kahn Netherlands), a Dutch company investing in the Dornod Project through its fully-owned Mongolian subsidiary Khan Resources LLC (Kahn Mongolia); and (3) Kahn Resources Inc. (Kahn Canada), a Canadian company that wholly owns both CAUC Holding, through a Bermuda vehicle, and Kahn Netherlands. CAUC operated in the Dornod Project under a mining license (License 237A) that initially covered two deposits, but which later, on CAUC’s application, was reduced to exclude a segment aimed at tax and fee savings. Such excluded segment was later acquired by Kahn Mongolia and covered by a separate mining license (License 9282X). In 2009, as part of its nuclear energy reform, Mongolia enacted a Nuclear Energy Law (NEL) and established a Nuclear Energy Agency (NEA). In October 2009, NEA issued Decree No. 141, which suspended 149 uranium exploration and exploitation licenses, including Licenses 237A and 9282X, pending confirmation from NEA of their re-registration under the NEL. In March 2010, NEA inspected the Dornod Project site, noting that the project failed to remedy certain previously identified violations of Mongolian law and listing further breaches of law. In April 2010, NEA invalidated both mining licenses, and declared later that they could not be re-registered to the claimants. The applicable international investment agreement was the Energy Charter Treaty of 1994 (ECT). The claimants initiated the arbitration in 2011, relying on four different instruments. Khan Canada and CAUC Holding invoked the arbitration clause of the joint venture agreement that created CAUC (Founding Agreement), claiming that the suspension and invalidation of the licenses constituted an unlawful expropriation, in breach of Mongolia’s obligations under the Founding Agreement, Mongolian law (including the Foreign Investment Law), and customary international law. Khan Netherlands relied solely on the ECT, claiming that, by violating the Foreign Investment Law, Mongolia also breached its commitment under the ECT through the operation of the treaty’s umbrella clause. Mongolia objected to the tribunal’s personal jurisdiction over Khan Canada, which was not a party to the Founding Agreement. While noting that the Canadian compliant was indeed not a signatory, the tribunal held that a non-signatory could become a “real party” to the agreement if this was the common intention of the signatory and non-signatory parties. The tribunal found such common intention based on evidence that Khan Canada had assisted CAUC Holding in performing its financial obligations under the Founding Agreement and that various non-official exchanges had in some occasions referred to Khan Canada, instead of its BVI subsidiary CAUC Holding, as one of the shareholders of CAUC. Mongolia further argued that it should not be bound by the arbitration clause of the Founding Agreement, to which it was not a party. Relying on testimony provided by the claimants’ legal expert, the tribunal found that one of CAUC’s shareholders, MonAtom, a Mongolian company wholly owned by the state, acted as Mongolia’s representative and undertook obligations that only a sovereign state could fulfill, namely, committing to reduce the natural resource utilization fees to be paid by CAUC, thereby giving the tribunal personal jurisdiction over Mongolia under the Founding Agreement. The tribunal first looked at whether Mongolia had a legal basis for the invalidation of the licenses. Disagreeing with Mongolia, it did not find that the claimants breached Mongolian law. After a proportionality analysis, it concluded that the invalidation of the licenses was not an appropriate penalty, even if the alleged violations had existed. Therefore, the tribunal found Mongolia failed to “point to any breaches of Mongolian law that would justify the decisions to invalidate and not re-register” the mining licenses (Award on the Merits, para. 319). Further, it found, based on evidence presented by the claimants that the alleged breaches were pretexts for Mongolia’s real motive to “[develop] the Dornod deposits at greater profit with a Russian partner”. Turning to the procedural requirement, the tribunal found that the claimants were denied due process of law. In particular, it found that Mongolia had an obligation to re-register the mining licenses as there was “no legally significant reason why the Claimants would not have fulfilled the [prescribed] application requirements”. The tribunal further found that, since the mining licenses were never re-registered under the newly enacted Nuclear Energy Law (NEL), the invalidation procedure provided in the NEL would not apply to those mining licenses, and Nuclear Energy Agency (NEA) did not have authority to invalidate the licenses unless they were re-registered under the NEL. Based all these reasons, the tribunal concluded that the Mongolian Government had breached the ECET by invalidating licenses of uranium mining of CAUC Ltd.
Certain challenges and opportunities exist in international investment. Overviews on these challenges should be updated frequently as the regime governing the relations between international investors and governments constitutes the most important form of international economic transactions in the globalizing world economy.In addition to that, the role of international tribunals to these updates is magnificent. As mentioned above history of the international investment says that the law was developed more in the arbitration, rather than through intergovernmental institutions. Such case as Khan Resources v. Mongolia clearly touches all the necessary issues within the area and the tribunal sets out the interpretation to eliminate further misunderstandings. As most of the host states are implementing new legislations to attract more investors or make the legal environment more favorable to them, this very case points out question where the legislator should be more careful. Karl P. Sauvant, The International Investment Law and Policy Regime: Challenges and Options, 2015. KPMG annual report on Mongolia: Investment in Mongolia, 2016.